On July 4, 2013, OHI fellow Billy Kenney released his first book entitled, “The Gospel According to Saint Franchise,” through Amazon Kindle Direct Publishing. This book is a satire based on the Gospel of Matthew. It follows Jesus and his disciples on a darkly humorous journey as God reveals his true desire for the future of the people of Israel. By faithfully abiding temptation and trial Jesus has demonstrated his worthiness and is now prepared to claim his proper title of Messiah, and his rightful place as the unquestioned hegemon of world affairs. “Tell me Son, how can the mite of a widow ever possibly compare with the might of an army?” asks God. Thus begins Jesus’ quest to use all possible means available to him to make sure that Israel becomes the most resplendent empire that the world ever has or ever will see. He is Saint Franchise, the brand above all brands who will bring hegemony over the entire earth in the name above all names! In partnership with the Bluegrass Community and Technical College & the University of Kentucky, Dr. Steve Pavey facilitated a week long participatory action research project at the LLCEC (Latino Leadership College Experience Camp). The youth called their project, “Walk a Mile in Our Chanclas: Nuestra Lucha as Undocumented Students in Kentucky.” Dr. Pavey hopes this pilot project will be the seed that grows into a regular program he is calling the Artivism Research Collective. 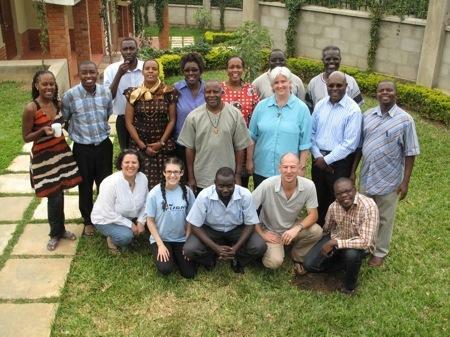 In July, One Horizon co-sponsored Amahoro Africa’s first “Theological Intensive,” intended to introduce African church leaders to cutting edge thinking and practice from some of the world’s leading theologians. The intensive was hosted in Entebbe, Uganda and led by Dr. Emmanuel Katongole, a Ugandan priest and professor of theology at Duke University. Held at Dr. Katongole’s guest house on the banks of Lake Victoria, the intensive welcomed twenty leaders from Congo, South Africa, Burundi, Kenya, Uganda and the United States. Amahoro Africa is a growing indigenous movement focused upon facilitating “holistic transformation by encouraging, resourcing and connecting emerging African leaders who are committed to the tangible manifestation of justice, mercy and goodness in their local context.” One Horizon is proud to be a sponsor of the work of Amahoro and the ecumenical spirit that animates this work.